Dhamma sharing for one’s practice is that one practices patience. The reason one practices patience is to be able to watch and control ones emotions. Emotions that arise from greed, lust, hatred or delusion. Thinking and conceiving brings about emotions. Especially lust. These emotions are caused from body, speech and mind. When one practices patience, one is then able to fully develop mindfulness (sati), concentration(samadhi) and wisdom(panna). 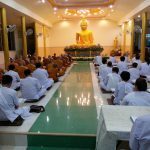 Another question posed is by an earnest practitioner of the Dhamma… he was meditating between 2 to 4 hours (previously he stayed for a while at a forest monastery). However he was finding it harder to keep his mind focused with his mind wavering more. He wanted to know it is because he is now no longer in the monastery environment but in the outside world? At the same time, he wanted to know which manner of breath meditation practice is suited (for example should he be focusing on the breath moving from nostrils to the abdomen or should his attention fixed at the nostrils on the in and out breath? While breathing, you can aware of rising and falling on abdomen or in out breath on nostrils. There are alright. Meanwhile, you must be aware of your feeling while practing. You shall be aware of do you feel relax, ease and natural in term of body and mind. If you do feel there is tension or stiffness, then you need to be aware of breathing. Breath in and breath out naturally, do not control the breathing process. Be aware of the breathing, breath in and breath out naturally. Feel a sense of relax so that your mind is composure. By breathing in and breathing out, it helps to balance the 4 elements, ie fire, earth, water and wind in your body. As long as the four elements are balanced, tranquillity is achieved. If thoughts arise, breath in, pause for a while, then breathe out. Use the breathing to synchronize the body and mind so that one relax and calm. Be aware that is the body relaxed and mind feel natural. If both of the body and mind feel relaxed and stable, then you are on the right path. Otherwise, breath in and breath out naturally, do not control your breath. If you do feel distracted by the external objects and have a sense of suffering after retreat, it means lack of mindfulness. When you are hearing sound, sound is sound. when the interpretation is started and you give meaning to the sound, your mind is reacted. Mindfulness needs to be practiced in the middle (majjhima) path. Mind is not reacted in extreme, not too hard (strained) or soft (accepting). Why we are suffering?it’s because of we are attached to the things that we have seen or what we have heard, our minds react with it. When it’s happening, breath in and breath out to relax the body and mind. When mindfulness presents, contemplate those external objects are dukkha (suffering), anicca (impermenant), anatta (no self). To contemplate and understand that whatever that rise will falls apart. Our mind cannot attach on it. Once we understood, the mind will let go of it. When wisdom arises and we will know what to do. You have faith, it is important to have patience too. By having patience and faith, you practice with perseverance and you will achieve peace and calm. Once composure is achieved, your mind will not react with whatever that arise. The mind that has the wisdom, make you understood and you will not attach on it and cause suffering. You may have learned a lot of knowledge about dhamma but you may be confusing unless you practice, experience and understand the dhamma. Whatever that arises or contact your senses, you must face it mindfully. While contemplating, mind must be in the middle (majjhima) path and unshakeable. Do not simply react and get attach on it. Wisdom can cease the cause of suffering in term of actions and responsibility. Khun Mae says there is a Dhamma lesson that is very important. You may already know a lot. In the past you may have achieved concentration, calm and happiness in your meditation….do not be attached to that past experience….let it go. Observe your present state of mind using mindfulness of what your heart feels. If in the past you have experienced insight during meditation on themes such as arising and ceasing, anicca (impermanence), dukkha (suffering, unsatisfactoriness)…. you need to experience it repeatedly. Understanding just once is not enough. Repeatedly investigate the same dhamma theme until eventually you really understand the matter very, very deeply, which is vipassana (insight). This is necessary to achieve the wisdom to understand the REAL dhamma. It is very important to investigate and discern repeatedly. Many people achieve the initial insight and then let go and move on. Don’t just have the insight once and then let go. Repeatedly investigate and discern until you really comprehend and then you will genuinely be able to let go.